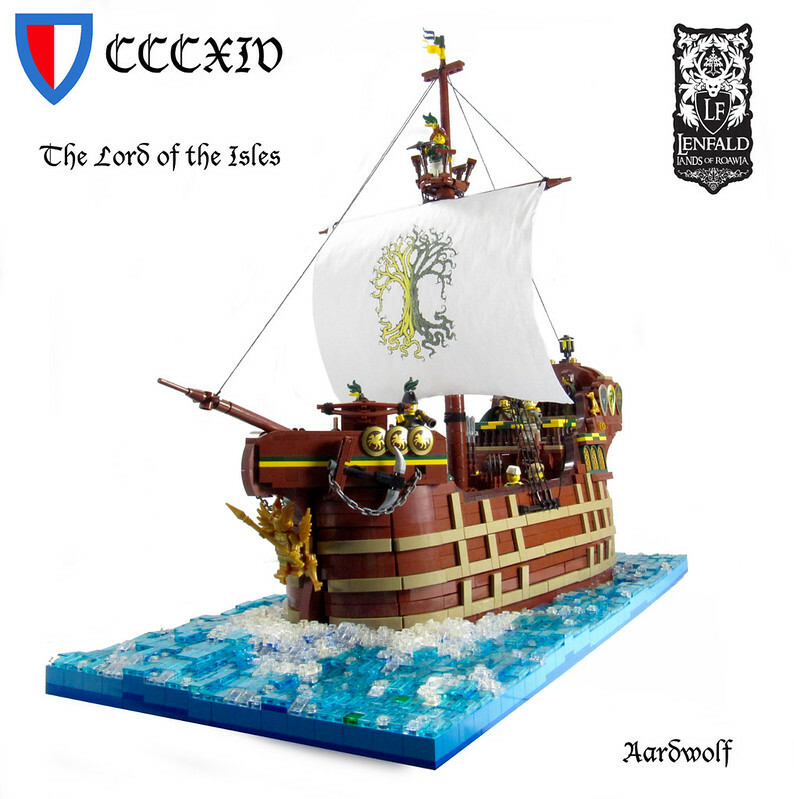 Hey all, it's been quite awhile since I was last able to build, but I just couldn't miss the Colossal Castle Contest - especially with a warship category this year. So, Instead of building a handful of rushed entries, I decided instead to pour my heart and soul into a single entry. I decided to revisit an idea I had when I built my first ship a couple years ago. I hadn't managed to make it work then, but I have come a long way as a builder since then. The technique ended up working even better than I had hoped, allowing me to build a sturdy, frustration-free hull with multidirectional curvature and minimal attachment points. This enabled me to make the sides of the hull removable, and to add an interior. The walls you see belowdecks are actually attached to the backside of the ship's frame, meaning that no matter which side is removed, the cabin will always appear as a complete cross-section. In addition, the entire ship is modular, allowing for the removal of the mast and rigging, forecastle, stern decks, hull, and even the main deck, which slides up over the mast. I really wanted to go all-out this year, and, inspired by JKBrickworks' working torsion-spring ballista, I decided to add a functional artillery piece to the deck. 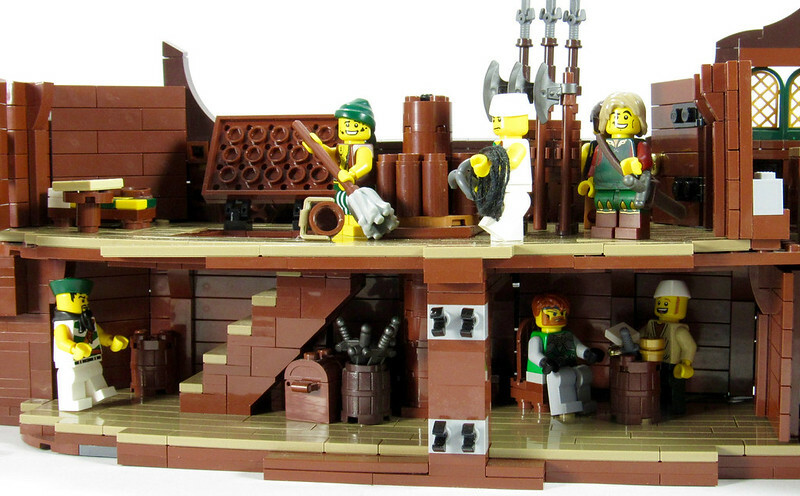 This was very challenging, as JKBrickworks' model is over 16 studs wide (much too big for mounting on the ship). Effective torsion springs took up too much space, so I instead lashed together flex tubes and built a scaled-down winding/ratcheting system that is similar to JKBrickworks' original design. It worked, and the ballista you see will wind, hold, and launch multiple projectiles across a desk. 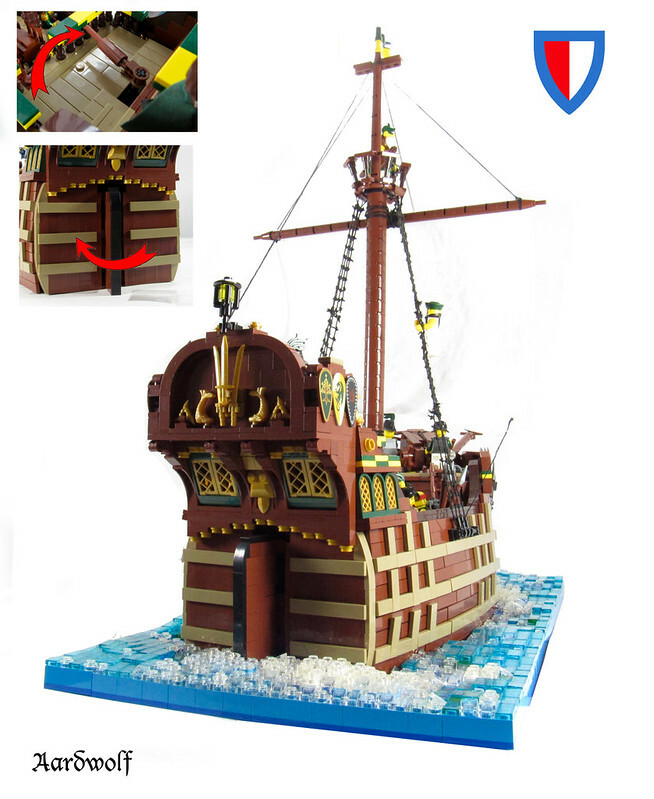 Finally, the ship features a working rudder and tiller, all-LEGO rigging (including the rat-lines, which are cut and sewn-together nets), deployable anchors, three projectile types for the ballista (bolt, harpoon, and ball-and-chain), crow's nest mounted crossbow, working doors and hatch, and a full crew including the VIP passengers, captain, navigator, sailors, cook, naval warfare officer, ballista crewmen, marine detachment commander, marine boarder, "Leatherhead" marine sharpshooter, and expeditionary marine. I hope you enjoy this build as much as I enjoyed building it! As always, comments and criticism are welcome and appreciated, and there are (and will be) more pictures on Flickr. Happy New Year! Wow. Very impressive build. The design is very smooth and the interior is a nice touch. This is one of the best lego ships I have seen! It has a very nice shape, and I love the pattern you made using those dark tan tiles around the hull. Very pleasant, consistent color scheme! Gorgeous ship and I really like the sail you made. Nice interior as well, impressive fitting that in with a complex ship. Really excellent! The hull shaping is great! Also the water looks perfect!